Over the years the Minnesota Vikings have had some of the great receivers in the NFL - players like Cris Carter, Randy Moss, Steve Jordan, Anthony Carter, Jake Reed, Ahmad Rashad, etc. etc. etc. So when I went to paint this receiver for the new Minnesota Vikings, US Bank Stadium Art Collection there was not one particular player I used as a model. It would be too hard to single out one player for an individual painting. What I wanted to represent was the flying aspect of a hero or warrior of the Vikings. The Vikings had the best of the best warriors, and for so many years the Minnesota Vikings have had some great receiver players. Like the gathering of the very best Viking warriors, the Minnesota Vikings, over the years, have gathered great receivers to play along-side each other. And this painting is a tribute to them. 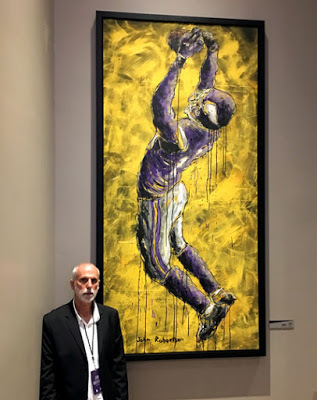 The Minnesota Vikings have hung the painting in the Valhalla Suites area of the US Bank Stadium. The painting is hung to the lobby area and the stairway entrance as you descend to the Valhalla Suites. Here is a description of the suites from the Vikings website: Located 17 rows from the field and between the 20 yard lines members will have access to the private Owner’s and Medtronic Clubs featuring elite all-inclusive food and beverages. Suites range between 24-32 tickets and come with VIP parking, other event access, away game trips and much more. The receiver painting is four feet by eight feet, acrylic on unstretched canvas.